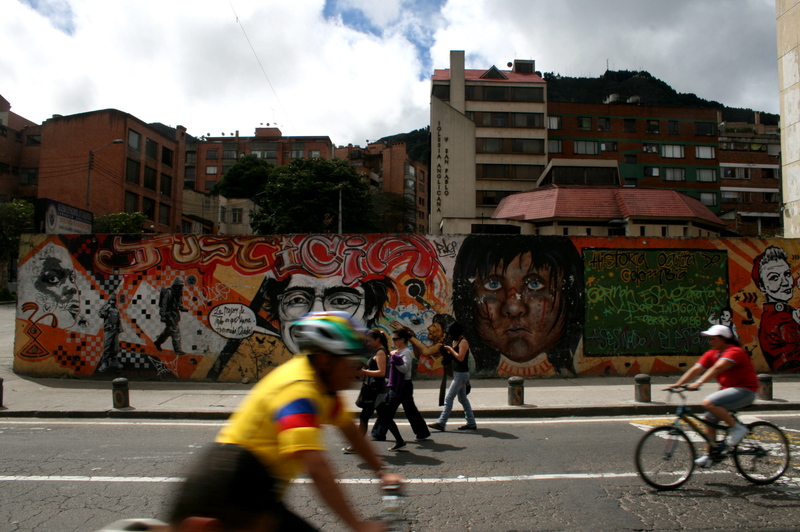 Transport experts met in Bogota, Colombia to discuss the future of sustainable transport in Latin America. Photo by Alex Hutchinson. This past week in Bogota, Colombia, transportation ministers, delegations and experts from around the globe gathered to discuss the development of the Bogota Declaration, a multinational agreement of sustainable transportation policies in Latin America. The first Foro de Transporte Sostenible (FTS) para America Latina (Forum for Sustainable Transport in Latin America) was organized by the Ministry of Transportation of Colombia, United Nations Center for Regional Development and the Inter-American Development Bank, with support from the Institute for Transportation Development and Policy, EMBARQ (the producer of this blog), and the Partnership on Sustainable Low Carbon Transport. According to the organizers of the forum, transportation is vital to give adequate support to the rapid economic and social development of Latin America, but the current patterns and trends aren’t sustainable. The concentration of transport in individual vehicles creates adverse effects in terms of congestion, pollution, health, energy consumption and greenhouse gas emissions. It’s possible to confront these challenges and change the direction of transportation development with the current resources dedicated to transport. The result of these policy changes to sustainable transport would save lives, generate conditions for equitable economic development, and protect both the local and global environments. The forum and its expert panel was structured around the guiding principle of the “Avoid-Shift-Improve” (ASI) framework, which organizers hope will result in a paradigm change in the development of transportation policies. Dario Hidalgo, senior transportation engineer from EMBARQ and former deputy general manager of Transmilenio, Bogota’s world-renowned bus rapid transit (BRT) system, outlined the ASI approach as avoiding long motorized and unnecessary trips, shifting the tendency away from trips in individual motorized vehicles and improving the technology and operational management of transportation activities. German Cardona, Colombia’s minister of transport, emphasized his country’s focus on sustainable cargo and shipping, in addition to the creation of a new vice-minister of transportation position, which is currently filled by Felipe Targa. This position was created to exclusively oversee the sustainability of transport initiatives. Distinguished guests elaborated upon the ASI approach. Adriana Lobo from the Center for Sustainable Transport in Mexico (CTS-México), a member of EMBARQ’s global network, gave a presentation on avoiding or preventing long and unnecessary motorized trips. Lobo presented a case study about Aguascalientes, Mexico, a new development outside of Mexico City whose residents often face 2- to 3-hour commutes and who spend approximately 30 percent to 50 percent of their income on transportation costs. Lobo stressed throughout her presentation how this model of growth must be avoided to improve the quality of life for people in cities. Lobo’s presentation emphasized the need for sustainable land use policies in order to avoid the construction of mono-functional communities that require individual car ownership. CTS-México made urban development and accessibility recommendations to improve the quality of life for the future citizens of Aguascalientes. The local government adopted about 70 percent of the design recommendations, which included mixed land use, improved public spaces, bicycle and pedestrian infrastructure, and public transportation. Eduardo Vasconcellos of the National Association of Public Tranportation in Brazil elaborated on how to shift the traffic of pasengers to non-motorized options and away from individual motorized transportation. According to Dr. Vasconcellos, developing countries’ public policy needs to change the axiom to tackle the problems of efficiency and inequality. Latin American countries need to worry about the deep ingrained issues caused by inefficient transportation through the consumption of energy, the use of space, congestion, pollution and how these externalities affect society. The next forum is expected to be held in Mexico City in 2012.